Hey guys! Time for me to start posting some stuff here, so allow me to show you to my site. If you go to http://kelvinshadewing.net/res/graphics, you'll find graphics that I'm releasing to creative commons, meaning you can use it as long as you link to me and give credit. 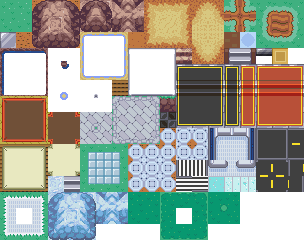 I'm reorganizing my tilesets and adding some new ones, so they'll be showing up later, too. Enjoy the pixels! Awesome! I look forward to seeing what you release! Sorry for not posting more of these sooner. I've got the first update ready right here. Downloading with a Gumroad account will give you automatic updates when I post new versions. Thanks Kelvin! These look great and fit very well stylistically with Tuxemon. I was a little disappointed with myself for not fixing these sooner. Ground tiles are now arranged so they can be more easily assigned to terrains, and flowers and rocks were moved over to the objects. I'll fill those empty tile spaces with something soon. Also added a few pieces that I forgot about before. I'll have the doors on their own separate sheet later so they can be used as sprites. Also, any information on how Tiled does animated tiles would be great. I'm still new to the tool and just used it to rearrange these. These tilesets are amazing! I love all the new terrains and objects that weren't in the previous sheets. 1. 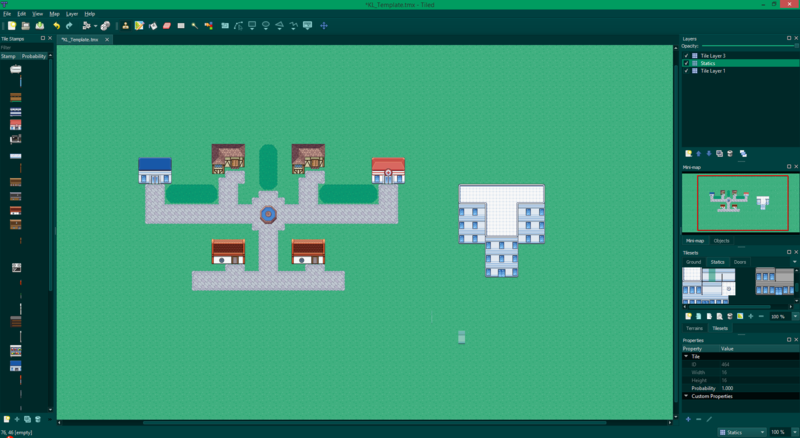 Open up the "Tile Animation Editor" after you have a new map created and tileset added. After that, you should be able to select the animated tile from the tilesheet (it will have a little film stripe across it) and place it on the map. If you had any other questions about Tiled animations, let me know! Aha, thanks for that. :3 Also, that window style looks familar; are you using Ubuntu? 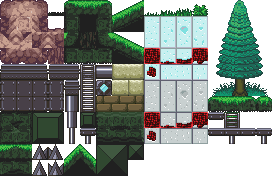 I also just finished including these new tilesets in the latest development commit. 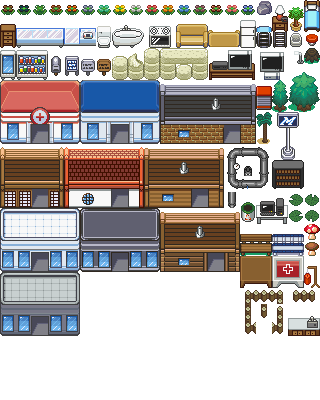 In the credits file, I attributed these tilesets to you under the XYG Open Source License v1.1. Let me know if you'd like me to change or modify any of your attributions. Thanks again! Ah, I gotcha. I have it on OpenPandora. Also, added doors and packaged it all into a neat little zip file. Moved to Adfly so I can get some revenue without users having to pay for it. Well, you seem to know a lot more about Tiled than me, so maybe you can help me out. I added a water terrain, and now, everything is glitchy. Any idea how to fix it? Here's my current map template: http://www.kelvinshadewing.net/dl/KL_Template.tmx It uses the textures I liked to previously. Hey Kelvin, it looks like I don't have the platformer.png tileset for me to open the map. I'm not sure what you mean by "glitchy". Could you post a screenshot or anything I can look at? I would also make sure you're using the latest version of Tiled if you're not already. Save that and rename it, and it should work. As for glitchy, when I try to put water down on some tiles, it adds the wrong border. Everything else seems to interact with each other just fine. I noticed that you set the tile layer format to "CSV". Could you try saving it as Base64 or XML instead? Odd, I updated the file, same link as before. It no longer requires Platform.png, and I added some stamps so you don't have to repeatedly drag over multi-tile statics. So far, though, nothing I've tried fixes the water problem. *sigh* Been a slow time for me and pixels. 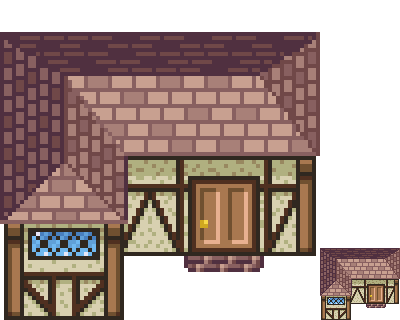 I should be doing more tilesets, but, eh, just been feeling kinda dry in that department. But, I did make some gems. Dunno if they'd be much use in the game, but at least it's something. Thanks a lot Kelvin-these are some awesome sprites! There is no immediate need for gems in Tuxemon, but I'm sure they can be added in the game in the future. It would be fun to be able to find them in caves and sell them for money. If you have any other ideas let me know! I really need to start making some creatures, though. I like it, Kelvin! Keep up the good work - I hope we can get this in the game soon! So, I added a bit to the modern style large building so now it can be made in different shapes. If people have unusual floor plans, they can now make a building to match. I also made sections without windows so there doesn't have to be windows on every tile. Go nuts! Click here to download the latest update. I'll be uploading all updates to the same zip archive, so all these download links will give the latest version. I'm just reposting them to save people from having to scroll back. Great. :3 I'm gonna work on some more modular building styles, especially since I want my own game to have a semi-steampunk look. I like how that looks like! Oh, boy, it's been a long time since I posted an update here. Um, OK, I made some more objects, and I also started a GitHub repo so anyone using my assets can just do a quick pull request and get the most up-to-date versions of everything. You can find that here: https://github.com/KelvinShadewing/pixels Just click on the rpg folder to preview/download what I've got so far. The sheets are starting to get kinda big, so I dunno if I should embed them here.